October 2, 2017 By Tina M 12 Comments This post may contain affiliate links. Read my disclosure policy here. Traveling to Hawaii has been my all-time favorite vacation destination. I have been to Oahu, Kauai, and Maui (twice), and plan to visit the Big Island this next year. One of the questions I get asked very most is “Which Island is better? 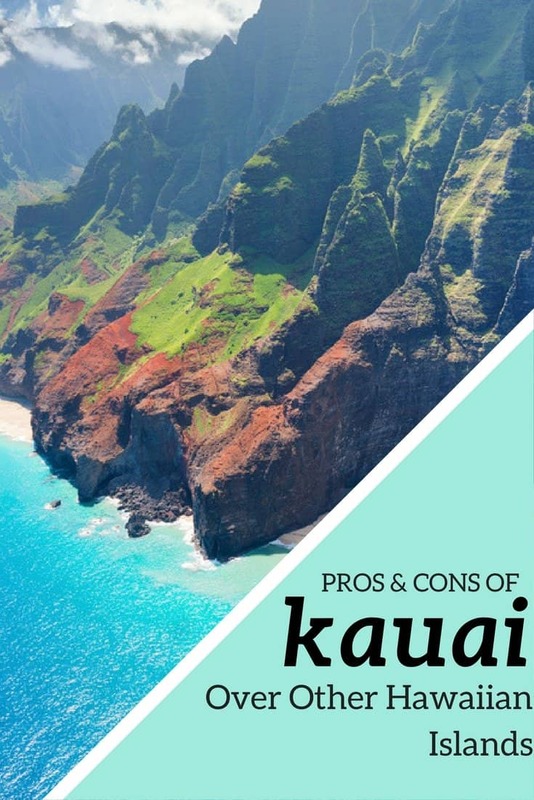 Maui or Kauai?” I’m going to focus today’s post on Maui vs Kauai because although I love both islands very much, they are very different from each other. 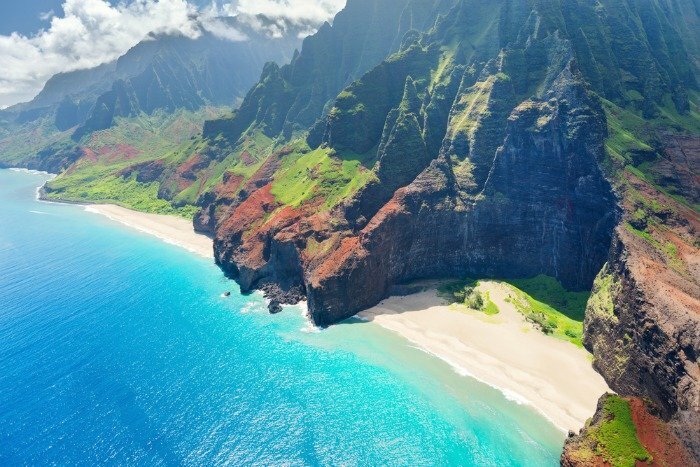 Before you dive into this article, read our main Hawaii Tips article where I share everything I wish I knew before planning my trip to Hawaii. Our very first trip to Hawaii, we spent 3 days on Maui, and then 4 days on Kauai, which in my opinion is the very best way to do it! It’s not that much more to add an inter-island flight to your trip. I would only advise this if your trip is going to be more than 7 days long though. Otherwise you just won’t have enough time to see both islands like you should! P.S. If you visit Maui, our favorite area to stay is along Ka’anapali Beach. This is our favorite place by far (we’ve stayed at this resort 3 times). Maui vs Kauai: What’s the Same? Maui vs Kauai is a difficult comparison, because you really can’t go wrong going to either island! I deeply love them both. Both have wonderful hiking opportunities and equal amounts of outdoor adventure, as well as unlimited ways to relax and rejuvenate. Both have good snorkeling, although Maui’s is better in my opinion due to calmer waters. 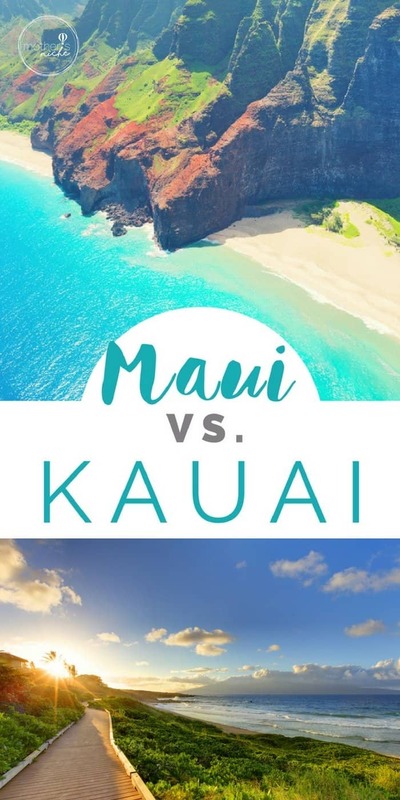 Maui vs Kauai: What’s Different? 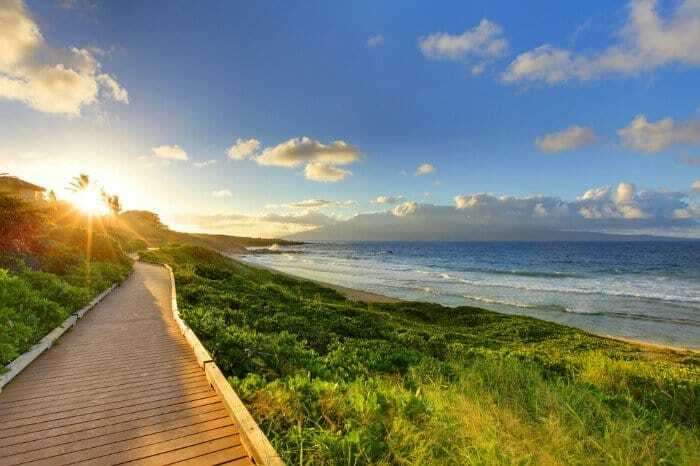 Maui is Hawaii’s honeymooners’ destination due to its calm waters, touristy appeal, and beachfront accommodations. The best place to stay on Maui (in our opinion) is the west side. See West Maui Hotel Reviews here, or check out the top 50 West Maui vacation rentals on VRBO. Haleakala – Haleakala is the large dormant volcano taking up 40% of the island. You can drive, bike, or hike parts of the volcano, and it’s really popular for the sunrise at the top (although I recommend sunset for less of a crowd). Road to Hana – Arguably one of the most beautiful, scenic drives in the world with waterfalls and beaches at every hairpin turn. 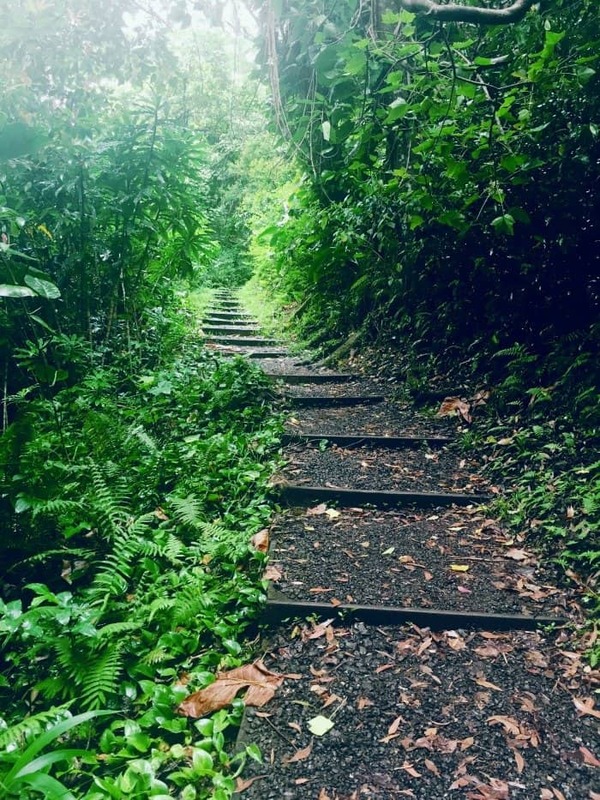 Most of the amazing beauties that you find pinned on Pinterest, are sites from the Road to Hana, including white, black and red sand beaches, the bamboo forest, all kinds of waterfalls, and the famous rainbow eucalyptus trees. Maui is more accessible: Maui has a lot more going on close together (especially if you are staying in Lahaina). Your main drives that will be longer are going to be Road to Hana or Haleakala. Everything else is pretty close by. Better snorkeling and more beachfront properties. Maui is going to be more touristy, and as such you have a lot more options for beachfront properties and resorts. Whales. If you are traveling during winter, Maui is going to be your choice for whale sightings. Whales have been spotted off of Kauai, but not nearly as easily as Maui due to more protected waters. In fact, many have spotted humpback whales from their hotel room (bring some binoculars). Swimmable beaches. once again, because the water is more calm in Maui, you have many more options for swimmable beaches. You can find some swimmable beaches in kauai, but you will be driving more. cons: Maui isn’t quite as lush and quiet as Kauai since there is more touristy appeal here. Napali Coast – The mammoth coastline is featured in countless movies (Like Jurassic Park). Although the coastline is majestic and beautiful, it’s hard to see unless you boat, kayak, or hike this coastline. Helicopter tours are also offered. We did a top-rated boat tour, and although the site was spectacular, I probably wouldn’t do it again due to how choppy the water was. We had people barfing off the side of the boat, and we went during the calmer season when it was calm enough to go in the caves (I can’t imagine doing this in winter). Waimea Canyon – Considered the “Grand Canyon of the Pacific,” this Hawaiian grand canyon offers jaw-dropping views and adventurous hiking opportunities. Rivers to Kayak: Unlike other islands, Kauai has a few rivers that you can kayak! We almost booked a vacation rental that was walking distance to Hanalei river. It sounded so fun! Quiet: Kauai is going to have less families and honeymooners, so if you want to go somewhere quiet with fewer people, Kauai is your island! Monk Seals. The total population of Hawaiian monk seals is 1,100, so seeing one is a pretty big deal. The chance that you will see one while in Maui is extremely rare, but we saw TWO while in Kauai! In fact, our resort had a special protected spot where they like to rest. This picture below is a quiet beach we found near Hanalai Bay, and also where we saw a monk seal. Cons: I would say Kauai’s biggest con is that the water isn’t as calm here, and it’s the reason I chose Maui over Kauai for our second visit. However, I have been longing to go back and will probably choose Kauai next time. You really can’t go wrong choosing either island. My preferred way to go is to visit them both in one trip. 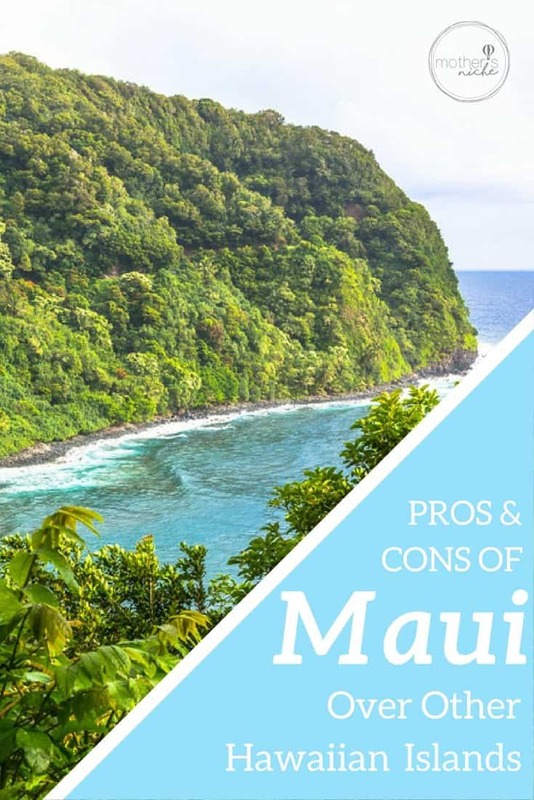 Readers opinion for Maui vs Kauai: Which would YOU choose? What is wrong with the south side? Just curious. I actually like the south side better. I loved Lihue and Poipu. I prefer Kauai but I live here on the north shore! Anini is the beach with the calm water since it’s reef protected. I’ve watched humpbacks breaching frequently while sitting in my beach chair at Anini. It’s a great place to SUP and kayak. I’ve seen many, many turtles, some coming on shore to rest, manta rays, and all kinds of fish. It’s a 2 mile beach so it’s rarely crowded, especially the west end. We visited Kauai, Oahu, Maui and Big Island for at month in 2015. 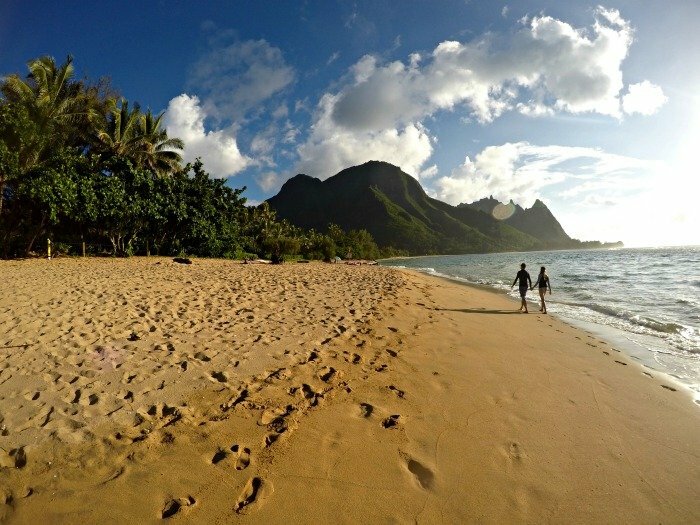 We are going back in 2019 and chose Kauai and Oahu to visit since we just love Kauai. We have kids of 14 and 18 and they also chose the two islands. The other islands are really nice and maybe we will go back sometime. We stayed at Poipu beach on Kauai south side and didn´t have time enough to go to the north og the island. But reading your reply will definitely bring ud to Anini the next time. Are there a speciel area where you have seen the turtles. Coming from Denmark almost on the other side of the planet, it is a speciel experience foro us. And my wife simply fell in love with turtles. 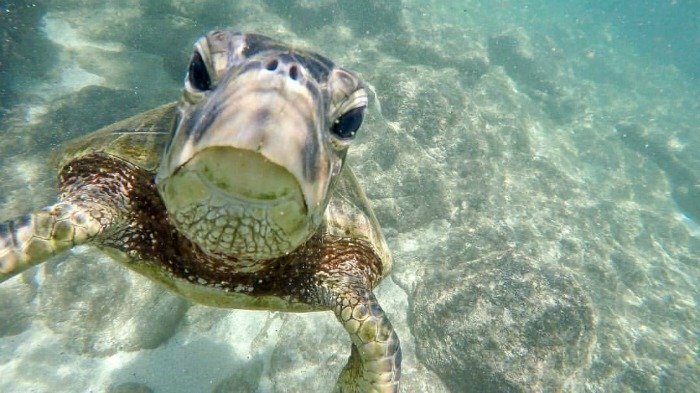 Visit Brennecke’s Beach from about 7:30-9:00pm and you will see several turtles swim to shore for the night. It is an awesome experience especially when people are respectful and keep their distance and do not shine their lights in their faces. Such a great treat. I took a cruise back in 2008 with NCL that stopped in all 4 main islands. Oahu, Maui, Big Island and Kauai. I thought I would love Maui the most but to my surprised was absolutely blown away by Big Island because of the snorkeling and dolphins that you can see. I ended up going back to Big Island twice, one for being my honeymoon. Big Island has the best marine life due to it being the youngest island with an active volcano and therefore lots of minerals. Beachfront isn’t as common as Maui but there are decent beaches like Hapuna beach. Driving does take a lot of time so spending 2 weeks on the Big Island is preferable. I just came back from Maui.. to change it up.. we will go to Kauai next. I think for me 1. Big Island, 2. Kauai, 3. Maui and 4. Oahu. Tina, my comment is related to your Lyme disease. My niece was horribly sick with it and went to Dr. Kyle Morgan in Ann Arbor, Michigan. She uses a RIFE machine to treat it and has cured numerous people. My niece is in perfect health now. Help! My husband & I just returned from Hawaii (Oahu) last Friday. We hadn’t even left the island (we were heading to the airport) and much to my extreme delight, we began talking about a “next” trip to Hawaii! No complaints here! We are trying to decide which island to go to….Maui, the Big Island, or Kauai. Any suggestions will be greatly appreciated. By the way, we had a wonderful trip! Fell in love with Hawaii!